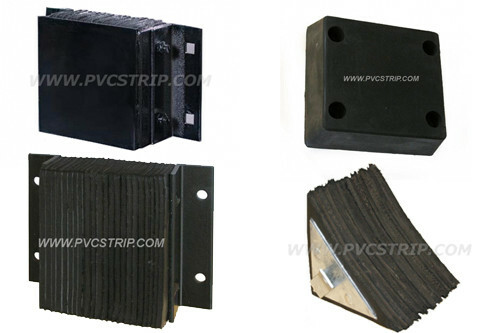 PVCStrip.com has a wide selection of loading dock bumpers to meet your warehouse shipping and receiving needs. Dock bumper models include molded dock bumpers, extruded dock bumpers, laminated dock bumpers and steel-faced bumpers. Loading dock bumpers available at PVCStrip.com help protect loading docks, buildings, trucks, inventory and other valuable property from the rigors of constant dock usage. When used with wall and corner guards, as well as wheel chocks and speed bumps, dock bumpers help to achieve maximum facility protection. Safety products such as dock bumpers and column protectors help ensure longevity for your building and its dock bays. Dock bumpers come in a variety of sizes with 4 and 6 inch projections and 6, 10, 12, 20, 24 and 36 inch heights. Lengths can be adjusted to suit a wide range of applications. As truck heights vary in size, vertically installed dock bumpers are commonly used in conjunction with horizontally installed bumpers for complete protection. Molded rubber dock bumpers offer protection for low traffic loading docks and in-plant wall protection from forklifts and other material handling vehicles. Extruded dock bumpers, commonly found in marine applications, are available in a variety of styles and designed for maximum application flexibility. Laminated bumpers are fabricated from tough, recycled tire pads and are ideal for heavy-duty traffic areas that receive consistent traffic. Please call 888-303-8515 to receive more information on loading dock bumpers or contact us.